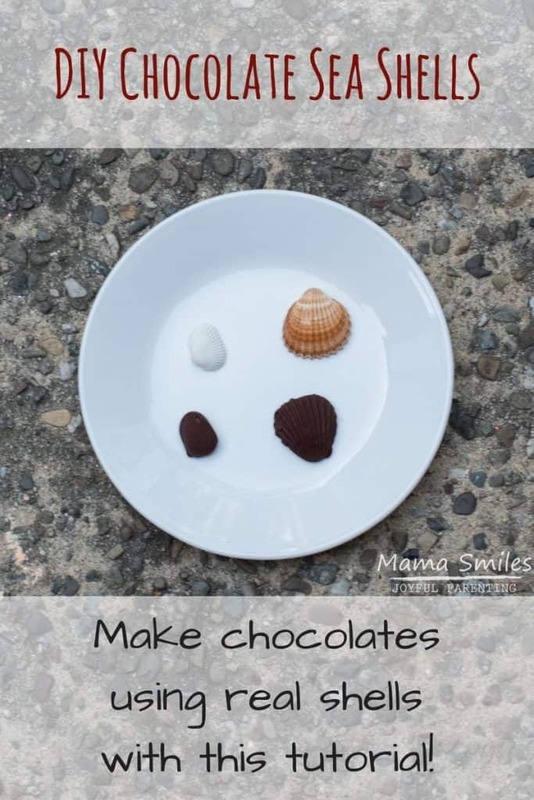 Tutorial on how to make DIY sea shell molds for homemade chocolate seashells.Turn your summer sea shells into year-round chocolates! 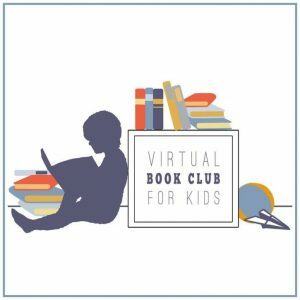 This week’s Virtual Book Club for Kids pick is A House for Hermit Crab by Eric Carle. 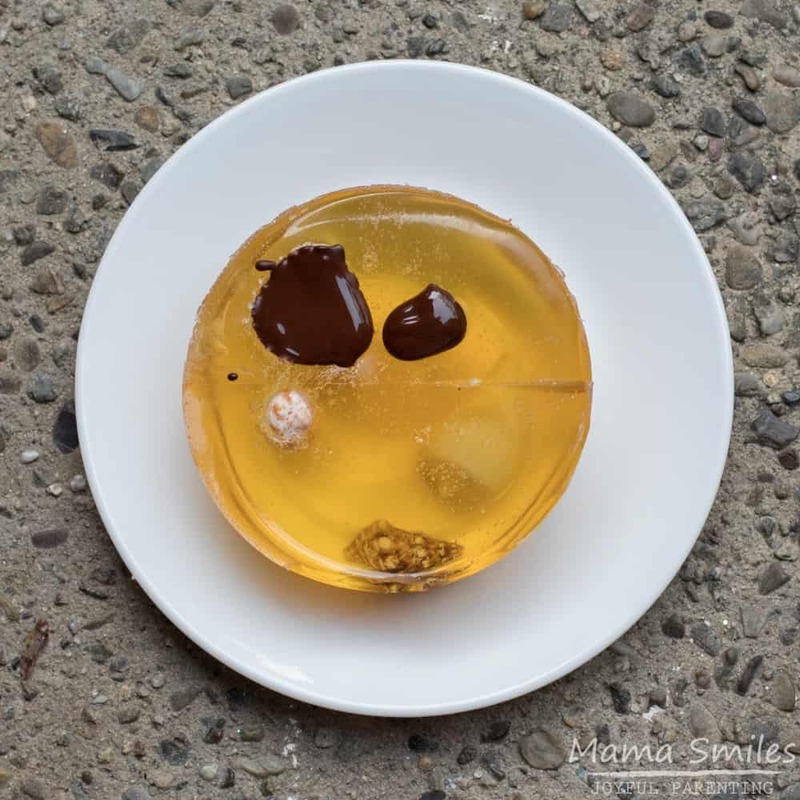 Composimold sent me this very cool re-useable food contact mold making material, so I decided to use it to turn some shells my kids saved from a beach visit into chocolate. It was a huge hit with the kids, and I’m sharing a tutorial today so you can give it a go as well. First, wash your sea shells thoroughly. You can even boil them in water to sanitize them, but I didn’t bother with that step. 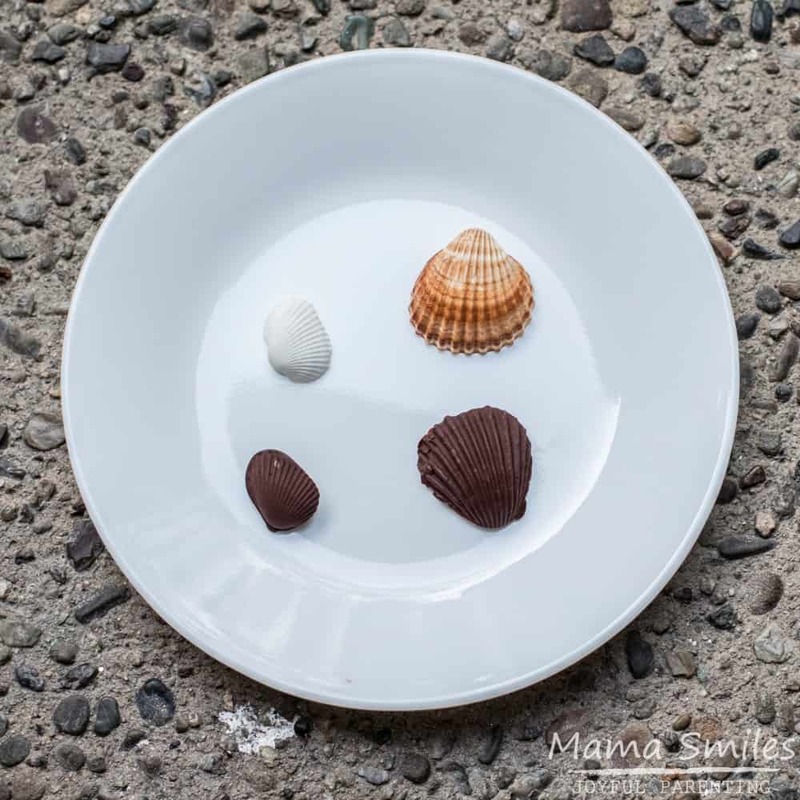 I loved seashell chocolates as a kid, and this was my chance to make them with my kids! Composimold is a heat and pour mold making material. I heated it up, and then stuck the shells straight in; I would recommend instead pouring it into a flexible container. 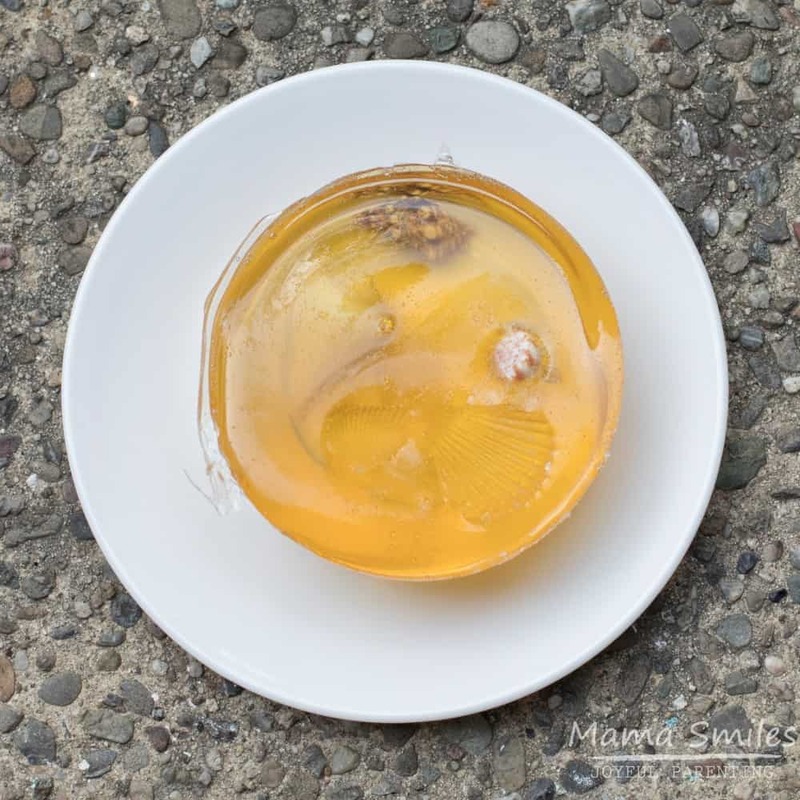 Silicone molds should work well! I was intending for the shells to sit on top. The clamshell type shells did, but the others sank! I should have put each shell into its own individual mold. UPDATE: This video from ComposiMold takes you through the steps of the ideal way to make a mold. to place the object you plan to mold on the bottom of a cup or container, and then pour the ComposiMold over them. Then to use the mold, just flip the mold upside down, pull out the original seashell, and go. Composimold recomends covering objects you plan to mold using mold release. I didn’t have any of that, and decided to risk skipping that step. Getting the shells out was no problem, although there may have been less resistance had they been coated with shell release. I melted chocolate bar to fill the mold. 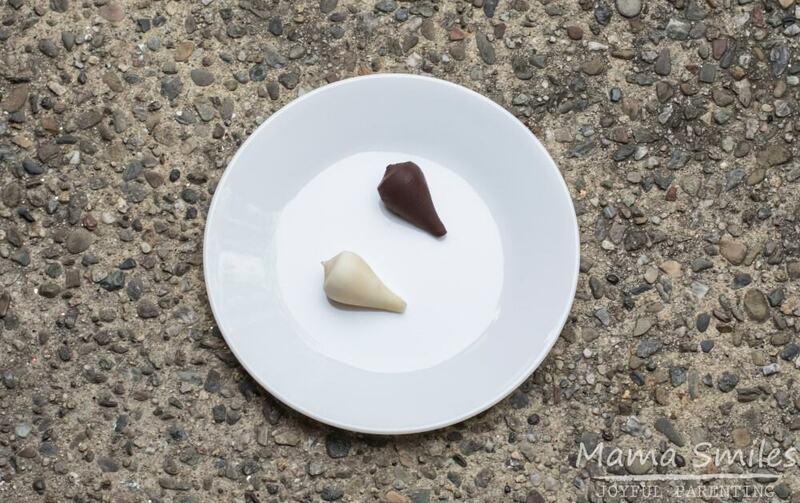 Chocolate chips and candy melts also work, as will fondant or your own favorite chocolate recipe. If you choose to melt chocolate chips or a bar, the chocolates will turn out best if you don’t melt them too much! Microwave for 15 seconds at a time, stirring in between. Or, melt using a hot water bath. I wasn’t sure how the shells that sank into the mold would work, so I just made castings of the clam shells first. They worked great! The other shells I was able to get out, but they were positioned in a way that made casting challenging, so I just skipped them. Choose your casting container carefully. Next time I plan to use our silicone muffin tins to create individual molds. The last, more complex shell worked because it has sunk all the way to the bottom of the mold and it was shaped in a way that allowed me to extract it from the molding compound and then fill that mold. When making 2 part molds, Composimold recommends embedding 1/2 of the original object in a polymer type clay, then applying mold release, then pouring the 1st half. Once this half has cooled and solidified, remove the clay, flip the mold over, and freeze for a couple hours, apply mold release and pour 2nd half. The temperature difference and the mold release keeps the 2 halves from bonding. Pull them apart and you’re ready to make your casting! We’ll see if I get fussy enough to take that many steps. Remember that Composimold is reusable! So if your first attempt at mold making fails, you can still try again. Composimold can also be used for materials like fondant – it’s not just for chocolate! I just like chocolate best. Here are some more great Ocean themed learning activities to go along with A House for Hermit Crab by Eric Carle. Click on the image above to see all of the themes, books, and activities for this year’s 2016-17 Virtual Book Club for Kids! I am updating the page as new posts go live. Next Monday is the final post for this year’s series! Have you ever made handmade chocolates? 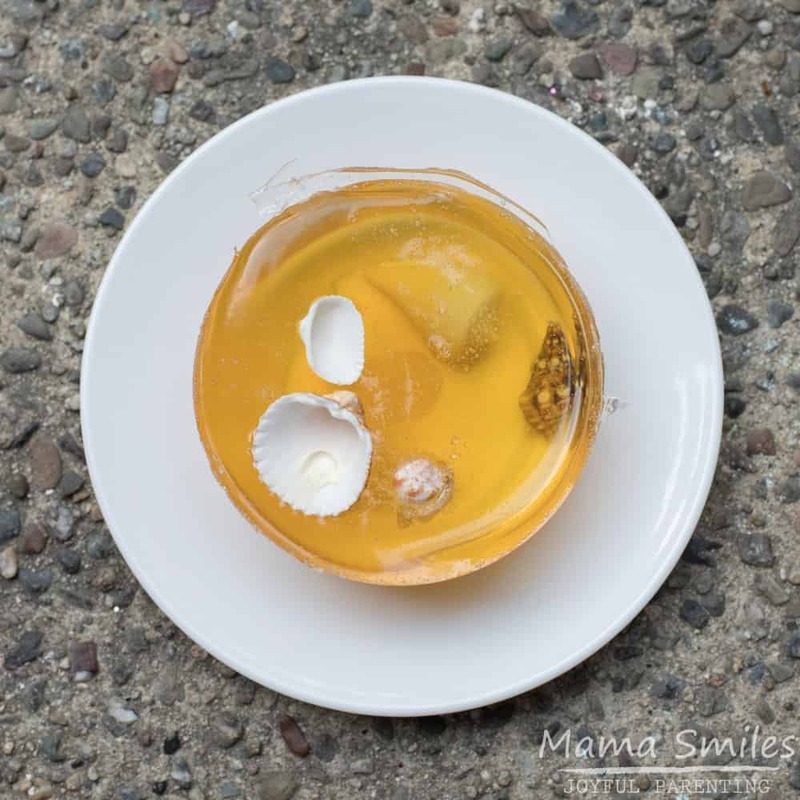 If you make our seashell chocolates, please share in the comments below, or on my Facebook page. You can also tag me on Instagram. Wow! They turned out great!!! Thanks! It was much easier than I expected. That is so cool! I love little candy molds, they’re so much fun.